Livin' in the Blurbs: Good Eatin'! I am the Frito Bandito. I love them, I do. I'll get them from you. Created by the well-regarded New York agency of Foote Cone Belding, responsible for such classic campaigns as "Does she or doesn't she" for Clairol, Smokey the Bear's "Only you can prevent forest fires" for the US Forest Service and the "501 Blues" campaign for Levi's, the Frito Bandito character was voiced by none other than Mel Blanc, famous for creating the voices of Speedy Gonzales and Bugs Bunny for Warner Brothers cartoons. Pulled off the air in 1971 due to pressure from the Mexican-American Anti-Defamation Committee because of its stereotyped image of Hispanics, it was replaced by the "munch a bunch of Fritos" campaign, a reviving of an ad theme the chip company had used in the late 50s. Why this sudden swerve into classic advertising? Have I suddenly had an urge to turn this blog into some paean to my former profession? The answer is a decided "No!" not just because that territory is being well-documented (relatively accurately, in my opinion) by the series Madmen. It's because my friend Ivy and I had lunch today at Podnah's Pit Barbecue and decided to supplement our heaping sandwiches (hers the brisket, mine the pulled pork) with their version of a Frito Pie. It would be easy to say the best part is that it's served in a torn-open (small-sized) bag of the famous corn chips, but that would be to undercut the ragu, the falling-apart, tender, shredded Texas chili that is in turn topped by shreds of cheddar and chunks of onion. The chili slightly dessicates the corn chips' harsh crunch, rendering them more pliable but still crispy because of the moisture (mostly fat) they absorb from the chili. This is by way of saying that for five bucks this is a heavenly combination, one that is not to be spurned because of any association with commercials, racist or otherwise, but simply enjoyed for what it is. 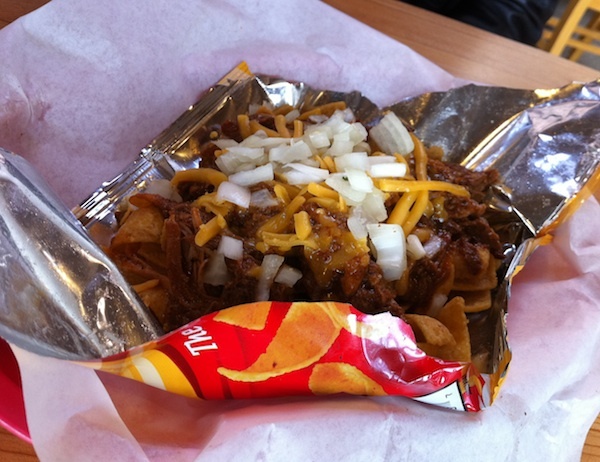 Details: Frito Pie at Podnah's Pit Barbecue, 1625 NE Killingsworth. 503-281-3700. I grew up eating Frito pies in San Antonio! That's exactly how it's made back there. Love your blog and your frequent mention of Clare at Big Table Farm. She's such a good soul. Wow, Jesica, that's so nice of you…thanks for your kind words! I was in the Alberta neighborhood earlier this evening and remembered your blog post. So, I hit this place. Had the Frito Pie - what great thing! Never had one before. Also had the wedge of lettuce with blue cheese (which played nicely off the chile) and a yummy Migration Cream Ale - also a nice thing to offset the spicy stuff. Always nice to hit the sweet spot!